Little Moreton Hall – an iconic Tudor manor house | A balanced diet . . . The Moreton family began to build Little Moreton Hall in the last years of the reign of Henry VII, and it was completed with various additions in the 17th century. Little Moreton Hall is the epitome of a half-timbered Tudor manor house, its black and white timber-framed construction and intricate patterns typical of the architectural features of that period. It is also surrounded by a moat. The main entrance to Little Moreton Hall over the moat, on the south face. Located in southeast Cheshire, near the small town of Congleton (where I was born), Little Moreton Hall remained in the same family for more than 400 years until it was given to the National Trust in the 1940s. I have memories of visiting Little Moreton Hall more than 60 years ago. My family certainly went there in the late 1940s shown in the photo below on the left taken, I believe, in 1947. I was born in 1948, and Ed in 1946; I think he must have been 12-14 months when this was taken, along with my mum and dad, sister Margaret, and eldest brother Martin. The other photo was taken from more or less the same spot just a few days ago. The west face of the hall – the trees have certainly grown in the past 66 years. The window of the Long Gallery is on the top floor. Much of the hall is open to the public, with the exception of a few rooms on the first floor. There is very little furniture in each of the rooms; you can take in the innate beauty of each of the rooms and their construction. The woodwork is exquisite. 1. Great Hall. 2. Parlour – with painted wall decorations. 5. Withdrawing room. 6. Exhibition room. 7. Chapel. 10. Gatehouse. 11. Bridge. 13. Brewhouse (now toilets). 14/15. Restaurant. 17. Hall porch. 18. Courtyard. 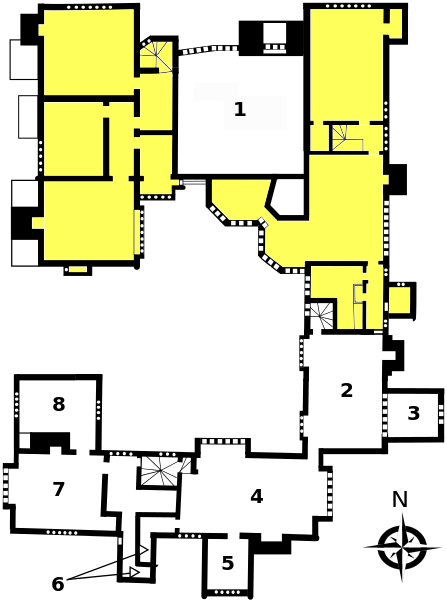 There are several rooms open on the first floor. 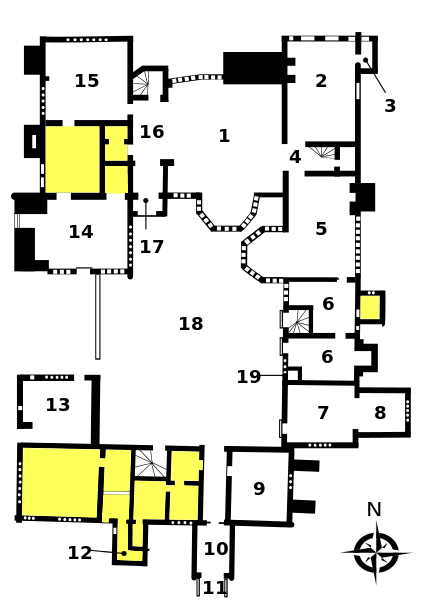 The first floor-plan (shaded areas not open). 1. Great Hall. 2. Prayer Room – now housing exhibits showing how the hall was constructed. 4. Guests’ Hall. 5. Porch Room. 6. Garderobe and privy. 7. Guests’ Parlour. 8. Brewhouse Chamber. The crowning glory of the hall is the Long Gallery on the top floor of the south wing. Apparently added at a later date from the original building, the weight of this floor has distorted the walls below, causing them to bulge outwards. Strengthening bars were added in the 19th century. But the unevenness of the walls and floor are easily seen in the slideshow below. The roof is covered on stone tiles, an additional weight that the overall structure could hardly sustain. The gardens are limited by the area of the island on which the hall was built. To the west is a small orchard, and on the north side a formal knot garden that is based on a 17th century design. The water quality of the moat must be quite high as we saw several large koi carp. But in Tudor times that could hardly have been the case, since the privies must have emptied directly into the moat. My first memory of Little Moreton Hall comes from about 1954. I’m not sure if we had made a special visit, or whether my father, as the Chief Photographer of The Congleton Chronicle, had gone there to cover an event. In any case it was my first encounter with Morris dancers. I still vividly remember the Manchester Morris Men dancing outside the hall in front of the bridge across the moat alongside the Manley Morris Men. Once upon a time we had a couple of photographs but I’m not sure if they exist any more. In any case, I did find these photos of them dancing in May 1954, as part of a Mid-Cheshire Tour, and another from May 1953 at Astbury. I’m grateful to the Manchester Morris Men for permission to use these in my blog. 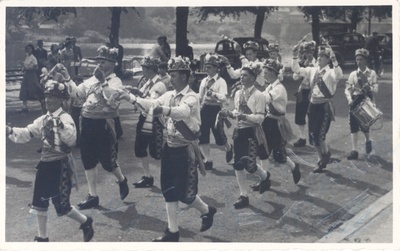 The Manchester Morris Men outside Little Moreton Hall on 8 May 1954. The Manley Morris Men dancing outside St Mary’s Church, Astbury, just down the road from Little Moreton Hall, 9 May 1953. There are pretty good indications that my dad took this photo and the other two at Little Moreton Hall. Manley Morris Men: I even remember the dancer on the left with the big grey beard – Leslie Howarth. This entry was posted in Musings from the past, Out and about and tagged Little Moreton Hall, morris dancing, National Trust. Your Dad was a fine photographer, the 1947 photo is so sharp for a family ‘snap’ from that era. As I’ve said before, the NT should have a link to your blog; you produce better publicity material than they do! I really enjoyed reading this blog post, the photographs are lovely. Do you by any chance know when the property was opened to the public? I know it was bequeathed to the Trust in 1937, but I am struggling to find information on when the doors were opened to the public. 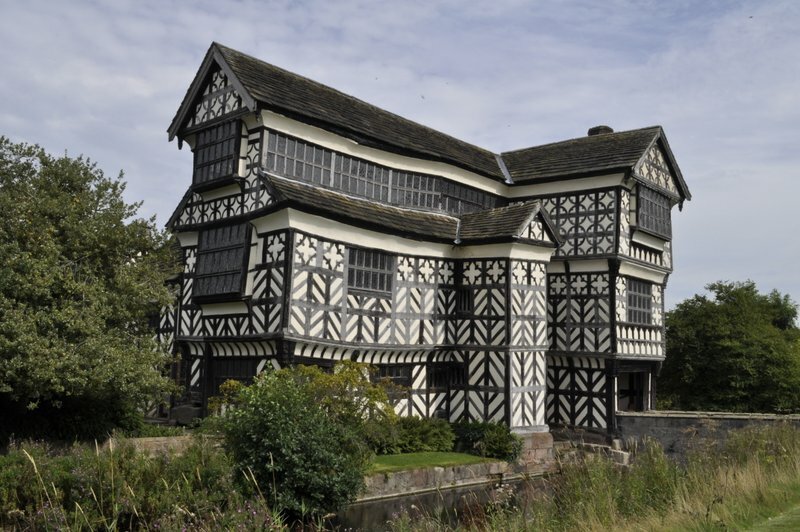 Apologies if that seems like a random question, I am currently researching an essay on the Little Moreton Hall and thus far have not come up with the information myself! Thanks for your kind comments on this post, Louise. I’m afraid I don’t have an answer to your query. There may be a link on the National Trust website where you can send a query. Good luck. I have done so, fingers crossed they get back to me but no word as yet. Thank you for replying so quickly to my comment! I wondered what had triggered a sudden interest in LMH. Thanks.